I have a couple of bags of frozen blueberries in my freezer. But right now freezer space is at a premium. So I need to empty some of its contents and one of those bags of frozen blueberries needs to come out. I’ve got plenty jars of jelly/jam in my pantry so there’s no need right now to make more Blueberry Jam. And a person can only (healthily) eat so many Blueberry Muffins. So my thoughts turned to ways to dehydrate some blueberries for my pantry instead. Turns out it was pretty easy. I decided I wanted blueberry powder instead of dehydrated whole blueberries. So first I poured the frozen blueberries into my blender and set them aside long enough to allow them to thaw. Then I blended them until smooth. Now I was left with blueberry puree. I’m using my *Excalibur Dehydrator to dehydrate the puree. My dehydrator trays will be lined with a *Dehydrator Sheet so dried puree doesn’t get stuck in the mesh grid of the dehydrator tray. But since my blueberries were pureed instead of left whole, dehydrating it was pretty easy. 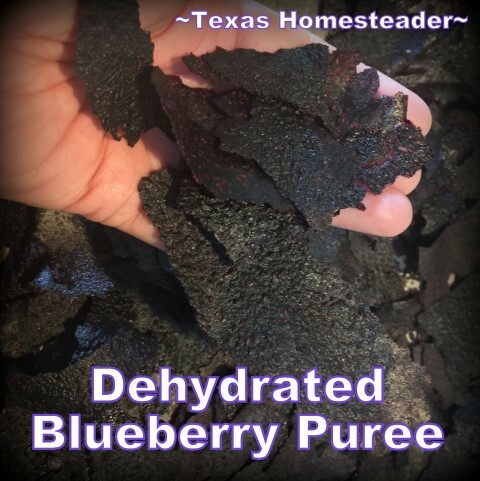 After adding the dehydrator sheets I added 1.5 – 2 cups of blueberry puree to each dehydrator tray. If your puree is pretty wet, a thicker ring will allow you to more easily remove it when it’s dry. If you spread it too thinly it will dry into crumbly hard-to-remove sections. Using the back of a measuring cup I spread the puree in a circle, slightly thicker around edges since the edge will dry first. A thicker puree disk might take longer to dehydrate, but it will also allow you to loosen the edges and peel the dried fruit more easily in one piece. Now I set my dehydrator to 135 degrees and allowed it to dry until the mixture resembles a fruit roll-up. Drying time will depend on how wet your puree is, how thinly you spread it, the humidity in your area and how powerful your dehydrator is. I had mine going for about 5.5 hours. After that time I turned the dehydrator off but allowed the puree to sit untouched overnight. 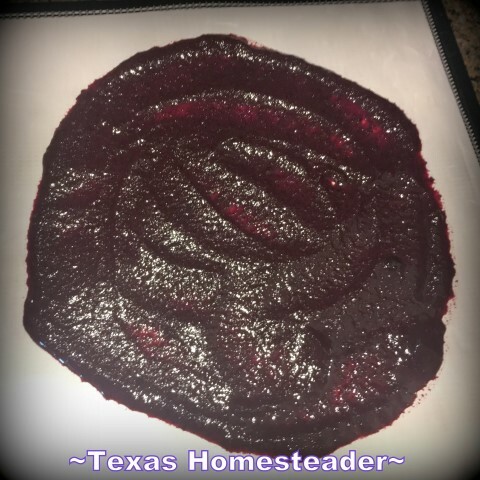 The next morning I peeled off my blueberry ‘fruit roll-up’ from my dehydrator sheet & flipped the dried puree disk over. I allowed it to air dry for another day. But it was still pretty pliable and I was looking for something a little more brittle. So I tore the ‘blueberry roll-ups’ into pieces & placed them in my oven that had been heated only 1 minute and then turned off. They were left in the oven until it completely cooled. This removed much of the stickiness and allowed me to more easily grind it into powder. I used a *coffee grinder I keep specifically for grinding dehydrated food to grind my dehydrated blueberry puree into powder. The powder was placed into a repurposed jar and I used a *Reusable Chalkboard Label to identify the contents. 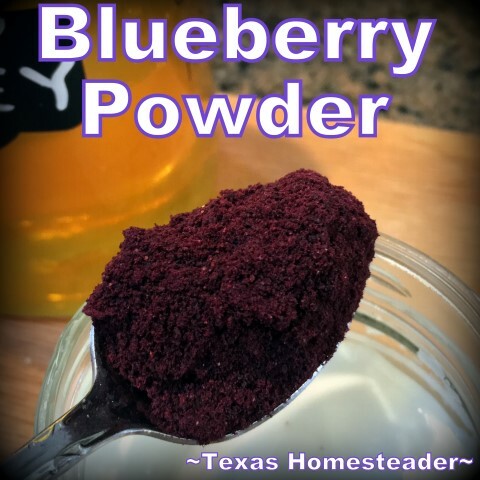 I typically use about a tablespoon each of this blueberry powder & raw honey stirred into my morning Homemade Yogurt. It adds a delightful blueberry flavor and of course I also reap the health benefits that come with eating blueberries. And I’ll typically stir in some frozen blueberries too. I’ve been told it also works beautifully stirred into pancake or muffin batter as well. 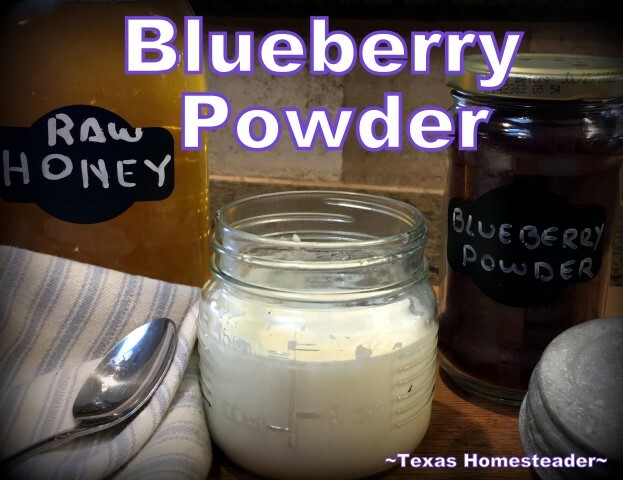 I found that the blueberry powder (like many fruit powders) will clump somewhat in the jar. I’ve read that this is because of the natural sugars contained in most fruit. The clumping hasn’t been a problem with my use because the clumps are soft. But desired you can either use desiccant or stir in some cornstarch. Personally I prefer it to be as natural as possible. So I just gently stir the powder with the back of my spoon before scooping some up. 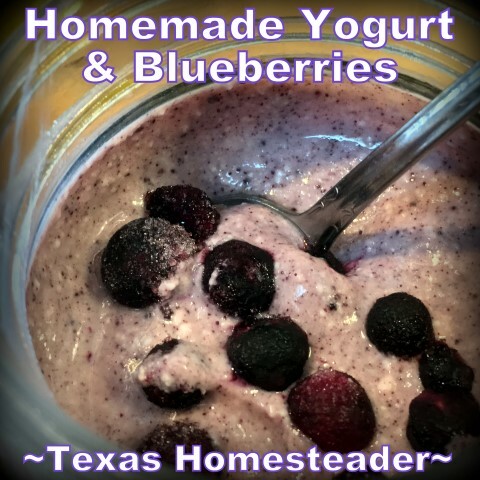 This entry was posted in Blog Posts on February 3, 2019 by Texas Homesteader.